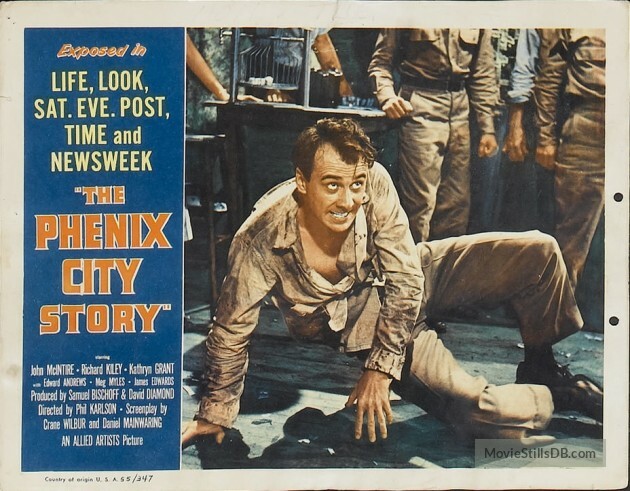 The docudrama The Phenix City Story (1955) is the latest addition to Old Hollywood Film's noir files. The Phenix City Story (1955) is a fascinating true crime noir that deals with real events in an Alabama town that was known as "Sin City, U.S.A."
The Phenix City Story begins when John Patterson (Richard Kiley) returns to his Alabama hometown after a stint in the Army. He plans to start practicing law with his father, Albert (John McIntire), but John's wife (Lenka Peterson) is reluctant to live in Phenix City because of the large number of casinos and brothels in the town that are controlled by a local crime syndicate. However, after the syndicate is involved with beatings, theft, and even murder, John and Albert decide to stay in Phenix City and help a group of concerned citizens clean up the town by having Albert run for Alabama attorney general. The Phenix City Story is based on real events that became a cause celebre in the fifties media. The local newspaper won a Pulitzer Prize for its reporting on the crime syndicate, and lurid stories about "Sin City U.S.A." were printed in several national magazines. Allied Artists International, a B-movie studio that churned out Bomba the Jungle Boy and Bowery Boys features, decided to capitalize on all the free publicity by making a ripped-from-the-headlines movie that was filmed on location in Phenix City. The result is a fascinating true-crime noir that still retains its sense of urgency and righteous anger. Prologue: The movie is preceded by a 15-minute prologue in which reporter Clete Roberts interviews several local residents, including Albert Patterson's widow and Pulitzer-winning reporter Ed Strickland. The unctuous Roberts comes off a bit like Ted Baxter -- he keeps asking people if they're afraid of being shot -- but the interviews are nonetheless quite fascinating. Location shooting: Director Phil Karlson insisted that the movie be made on location in Phenix City, which lends the movie an authenticity that is rare in true crime movies. Karlson expertly uses the neon-lit gambling parlors and bawdy houses on Phenix City's notorious 14th Street to give the movie a realistic atmosphere of small-town sleaze. John McIntire: Old Hollywood fans know McIntire for his many supporting performances in noirs and Westerns, but he is great here in a leading role that has him portray a real-life Atticus Finch. In fact, McIntire closely resembled Patterson, and he even wore some of his clothes throughout the film. Racism: The main focus of The Phenix City Story is gambling and corruption but the film does depict some of the systemic racism in the American South. The film shows white police officers using racial slurs, and an African-American man (James Edwards) who joins the citizens committee is subjected to particularly cruel treatment from the crime syndicate. Here's a fascinating local news report that shows what Phenix City is like today. If you've seen the movie, you will recognize many of the locations. 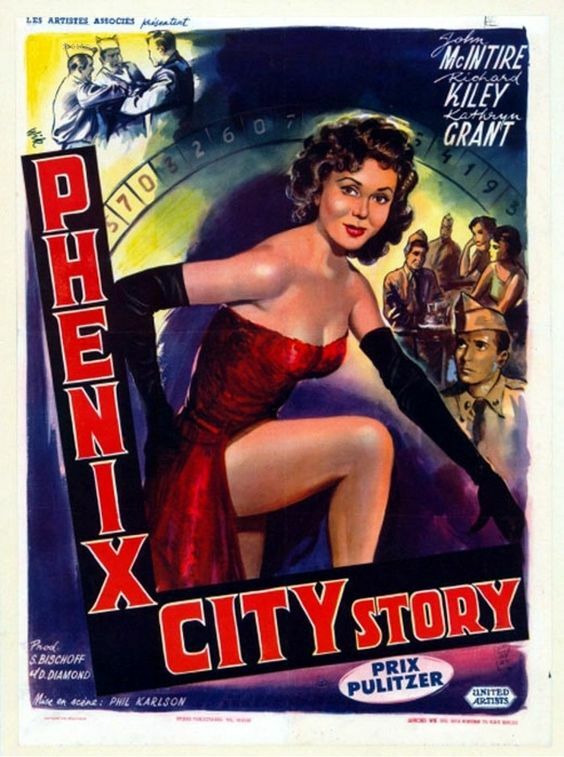 The Phenix City Story is part of Warner Archive's DVD release Film Noir Classic Collection: Volume Five. It is also available for streaming on Warner Archive Instant. The Phenix City Story is one tough film, both in subject matter, execution and, often, tough to take. It is a dandy, and I hope many will take your recommendation to heart. Me too. The movie is both a fifties time capsule and relevant to corruption in government today.